Use Twitter for amazing travel deals. How, you ask? Travel companies and airlines are increasingly using social networking sites like Facebook and especially Twitter to post their best travel deals on airline tickets, hotel reservations and other travel-related purchases. User of Twitter can follow the tweets of other users who specialize in a particular topic or who offer travel deals and other consumer bargains. So how does one avail of these deals? These days everyone is on Twitter! And if you have a favorite travel website or company, chances are it’s on Twitter. It’s a great idea to start by following it. 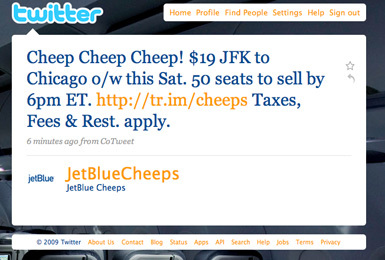 Next, you can use Twitter to branch out by following airlines, hotels and even destinations. By simply adding the “@” symbol to your nearest airport’s three-letter abbreviation will result in a “Follow” link. Click it. But as you add more travel specialists to your follow list, it’s good to organize your Twitter feed into separate groups, setting up specific lists for airlines, hotels, destinations and any other category you intend to use while traveling. If you don’t organize your Twitter travel feed, you’ll have a hard time making your way through a seemingly endless array of tweets and links. By following companies and people on Twitter, you have an an approved list of providers pushing information to you, there’s no reason you can’t go out and search for travel deals. Twitter’s search has come a long way and improved a lot from its inception. There is a simple and direct search by typing keywords in the search box, which may or may not give the results you were looking for; and then there’s the “#” sign. Refine your searches by adding a hashtag (#) before the query. For example, if you’re looking for deals in Munich, you might search “#Munichdiscounts” or just “#Munich”. Or, if you’re looking for hotels in Berlin, you could enter “#Berlinhoteldiscounts.” But, as we mentioned, don’t expect perfect results from these searches. Using Twitter purely for search purposes, like searching for cheap flights on Twitter’s home page, can be a little daunting. The results are often too wide. But if you’re keen to hunt through some irrelevant results — and you understand the unique lingo that allows people to communicate in 140-character bursts — searching Twitter can yield some real bargains. Some travel vendors issue Twitter-only discount codes that are usually cheaper than other deals they offer. Just pop a question on your 140-character box and include set of hashtags so that others know you’re looking for specific information. Asking your followers and the ones you follow is a great way to get advice on local hotels, tour operators and restaurants. The information can save you money, but it also can help you get value for your dollar no matter what your budget is. Guidebooks can be of great help on things to do, places to see, etc., but Twitter will offer more up-to-the-minute details on local attractions and accommodations. Found a deal on Twitter? Act fast. Twitter-only travel deals from airlines, hotels and other vendors are short-lived. While some deals are applicable for a 24-hour period only, some deals last for a few days or weeks; but are likely to be “sold out” in a jiffy.